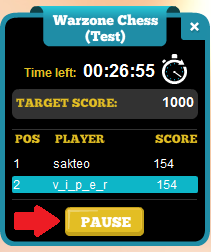 * Unlike traditional tournament systems Warzone Chess is not rounds-based. This means there is no waiting after each game for the next round and game to start. As each game ends the next starts instantly. * Just like all other tournaments the goal is to score as many points as you can - the highest score wins. Win as many games as quickly as possible to pull ahead on points and tiebreak. * Lower-rated players can get a handicap advantage to play their games. This means you have a better chance no matter who your opponent is. 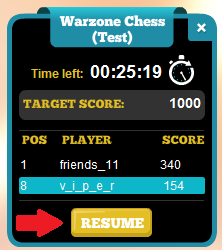 Each Warzone Chess tournament can have various settings. These are explained below. Each tournament can have up to three handicaps. First, with a time handicap a lower-rated player will start with a bigger amount of the total game time, while the higher-rated player will have less time at the start of the game. Second, with position handicaps a lower-rated player will be given a positional advantage at the start of the game, for example having an extra piece. Third, a points handicap will reward players with more points for a win the higher their opponent is rated. Each tournament may have none or any combination of the above handicaps active. This is the number of points a player starts the tournament with. These points are already added before playing a game. A player can increase (or decrease!) these points during the tournament. A player can be allocated a different amount of points for a win, draw or loss depending on the points system in use by the tournament. In a standard points system players get the traditional 1, 1/2 or 0 for a win, draw or loss respectively. A positive ELO points system is similar to the rating updates, with the exception that you can only gain points. On the other hand the negative ELO points system also subtracts points when you lose a game. In effect the ELO points systems act as a handicap advantage for lower-rated players. The multiplier is another mechanism which can affect your tournament score. This rewards players on a winning streak with bonus points for each successive win. The linear multiplier awards 1x points for the first win, 2x points for the second win, 3x points for the third win until 10x points for 10 wins or more. This allows any player to quickly shoot up the leader board when winning games. An additional option which affects the multiplier is the resets on loss setting. 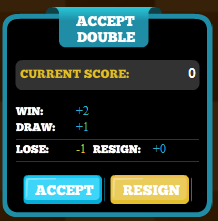 Should this option be active losing a game resets the multiplier back to its starting value. You will need to go on another winning streak to get your multiplier up again. If a tournament enables the doubling cube you will have an extra option available during your games. At any time while playing a player may double the points being played for in that game. A dialog will show the new point values being played for. The opponent has one of two choices - either accept and play on or resign straight away. The doubling cube can only be played once per game, so use it wisely. Each tournament is set to run for a specified amount of time. A tournament can end in one of two ways. First, when the allotted time runs out - in this case the player with the highest score at that moment wins. Second, a target score may be set which a player has to reach. If any player reaches a target score within the allotted time this also ends the tournament - that player is the winner. When a tournament ends all running games are immediately aborted and do not count towards the final standings. * the time of a player's most recent win. We realize that a tournament can be intense without many pauses to catch your breath! When the pausing option is enabled you will be able to take a break until you are ready to rejoin the action. Each tournament has a summary dialog for entered players, from where you can pause the action. When paused you will not be paired and no further games will start (though you will still have to complete your current game). Note that you can only pause a certain number of times per tournament. If you have closed the summary dialog, you can open it again by clicking on the "i" next to the Tournament name. The top games for each tournament will be displayed on the Games tab of the tournament home page. Click on the board icon to view a game. You can see the top players in each tournament on the Leaders tab of the tournament home page. This list will be updated automatically throughout the tournament. If you are a participant you will also get a quick overview on the tournament summary dialog. 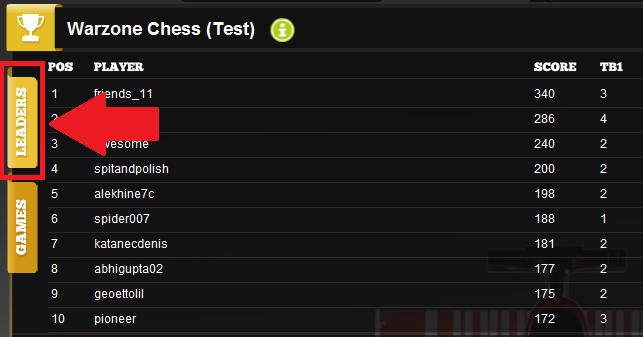 This will show the current tournament leader as well as your own position. We hope you enjoy these tournaments and have as much fun playing as we had creating them! For further information email [email protected].